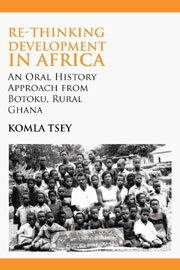 In this thought provoking book, Komla Tsey argues that if governments, NGOs, development donor agencies and researchers are serious about development in Africa, they need to get down to ground level, both metaphorically and literally. They must search deep into Africa’s own rich oral traditions by creating space and opportunity for ordinary Africans, whose voices have so far been conspicuously absent in the development discourse, to tell and share their own stories of development. Story-sharing as research methodology acts as a mirror, reflecting the participants’ self-evaluation of where they have come from, where they are now, and how to proceed into the future. They are strategies that can empower and enable individuals and communities of people to be agents of their own change which, in Tsey's view, is what development is all about.